We are very familiar of the feature in Prepopulating the fields to your JotForm via URL Parameters wherein the form always receive the parameter data. With this feature, form fields are automatically given default values when a URL address to the form with included parameters is clicked. What if you wanted to send the parameter data instead? And the target page is not a JotForm form? Example a: You can simply send the data via the URL parameter as mentioned in the link first shared above, you can also check this link to a guide that allows you to send data to another URL by prepopulating the target URL parameter from the form fields of form #1. Example b: We want to send the form field data to a target PHP script via POST method, this will NOT append the data in the URL parameter, which makes this method more secure. Being able to directly send the information from JotForm form into your own website or PHP script, provides a lot of flexibility in collecting data and as well as enhancing user's experienced since you are using your own custom web pages with JotForm. This tutorial will show how to send submission data via POST method and using the "Thank You" settings. 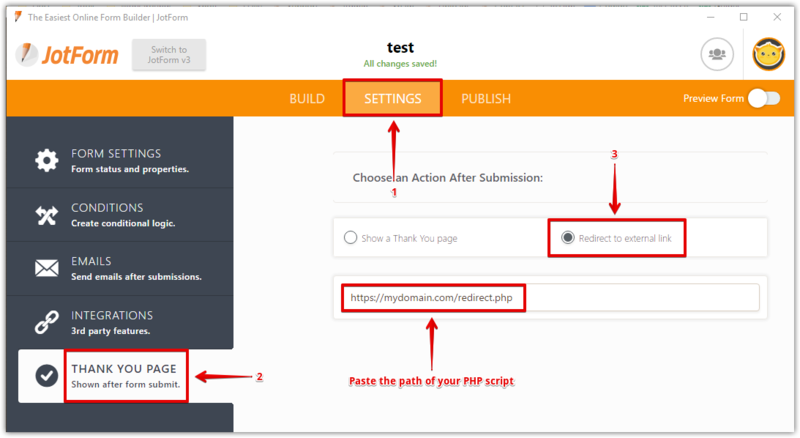 This JotForm feature uses the POST request method which requires PHP scripts. PHP is required to be supported and enabled on the web server of the custom page. The tutorial is divided into 2 parts. 1. Login to JotForm and create the form in the form builder. 2. To complete the form, enable the Send Post Data feature of the form. Just click SETTINGS at the top > FORM SETTINGS on the left > click SHOW MORE OPTIONS > scroll down and look for the SEND POST DATA option > then select YES. Navigate to "Advanced" tab and click "Show More". 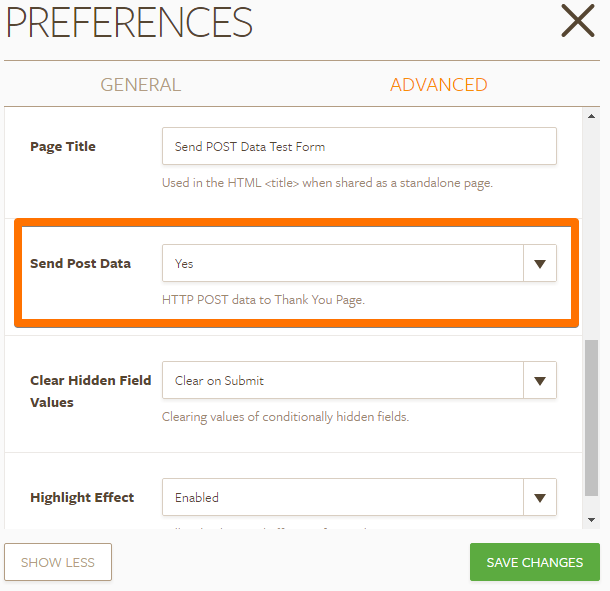 Here, enable the "Send POST Data", select "Yes" in the drop down option. 3. When satisfied with the form, use the "Thank You" Wizard to add the URL address of the target PHP script. To set this up, click SETTINGS at the top > THANK YOU PAGE on the left > tick the REDIRECT TO EXTERNAL LINK option > then paste the path to your PHP script. 4. Click the "Save Changes" button to apply the changes made. 5. Click Finish to save and close the wizard. 7. Preview and Test the form. The URL entered in the "Thank You" wizard's redirect to external link should be able to fetch PHP tags. 2. For the purpose of this tutorial, follow or copy the describe PHP scripts found on this guide. 3. Save the PHP page as redirect.php or you can name it anything that you like, it should at least have an extension of .php as a file. 4. Make sure it is deployed and located in your website with the correct URL address that was similarly used in step #4 in the Part 1 of this tutorial. Now in your PHP script, you can simply use those to fetch the data and use it as your own. Important: It is quite necessary that you have knowledge with PHP on this case to fully utilize and implement this. I suggest checking the links below to help you get started. 2. You want to pass data to another page or script but you don't want it to be populated in the URL itself. 3. Pass data to a 3rd party application that accepts POST data. I hope that helps. Feel free to comment below if you have questions or concerns, or you can also open a new thread in our forum page. Please take the autosuspend off my account. The action you have requested is not allowed." Great tutorial but something's not quite working right. We've embedded two jotforms on our wordpress site. 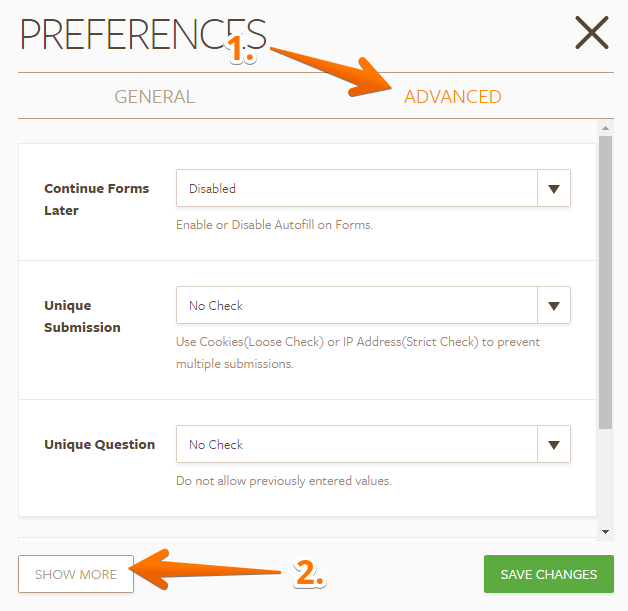 Form 1 needs to pass the email and name fields to form 2. The email field is posting fine but the name field is not. - then the name doesn't pass to form 2. It's just blank. Not sure what I'm doing wrong. Perhaps it's a conflict with wordpress files. Any ideas? When the data is submitted using this method a "preloader" graphic is displayed before reaching the custom thankyou page. Is it possible to remove the pre-loader or change the pre loader style? Hello, I want to pay with virtual POS, but not the project I'll use PHP ASP.NET MVC 3 Project. How we were able to integrate jotform with my project. Like php ASP.NET could you send the data to the project. thanks. Hi, is it possible to use a form field (let's say "Member ID") and have that generate a custom URL through the PHP script with that Member ID in it? For example, the url would be: www.example.com/memberid=MEMBERID where MEMBERID would be the six-digit member ID that they input on the form. Is it possible to accomplish this in the $url1 parameter? If a form has a file upload (e.g. a photo) POST does not seem to include the URL to the file, just the name (e.g. photo.png). Is the submission ID available in the POST also? Perhaps that way I can use the API to pull the photo URL. How can I work with a checkbox if I want to pass the result to the variable 5? I want to create a survey that asks several simple questions and then directs the user to a website with database results displayed based on their answers to all of the questions. For example, the answer string might be "producer, 25k, rural, Saturday." Depending on the entire string they would be directed to a website with a code for the database results which relate to that exact list which I will have already set up like so:[pdb_list filter="type=producer&amount=25k&location=rural&day=saturday"]. Is it possible to do this with JotForm? Ahhhhh... I think you just opened up my world. I want to perform financial and other calculations based upon selections within a jotform and have my calculated values passed to PayPal by the PayPal Pro Wizard section of a jotform. 2 - Pass this data via POST to a custom php page on my site named "redirect.php" (or whatever), who's URL I place in jotform A's custom Thank You page setting. 3 - Perform my financial and other calculations within my redirect.php file which passes it's results to jotform B who's PayPal Pro Wizard fields are thus prepopulated with my values. The user will see my the calculated values in their proper fields, fill in their credit card info and proceed normally. The user will experience a simple transition from A)making selections, to B) verification and payment. Is this the proper approach you would recommend for my needs? To find out the variable names and PHP code, simply set this URL as your Thank You URL, enable Send Post Data, fill your form and submit. Could you please explain "$var1 = "?fullName3[first]=".urlencode($answers[fullname3]);"
Is "fullName3[first]" the id of the initial form and "[fullname3]" the ID of the the field in the second form that should be pre-populated? My first form has the First name and Last name as simple text fields, and the second form (that I want populated with the names from the first form) has them in the "Full Name" format, could this be causing an issue? (I have the email pre-populating fine, but the names are not. If I understood what is being referenced by the redirect.php code (is it the field ID, name etc) I would be able to figure out my issue.